Posted on April 11, 2019 | 546 views | Topic : News & Articles, Property News. (Middle) LBS Bina Group Bhd group managing director Tan Sri Lim Hock San launches the community-living inspired Kita@Cybersouth township. Also present at the launch were (from left) MGB Bhd executive director and deputy CEO Isaac Lim and LBS executive directors (second from left) Datuk Cynthia Lim, Datuk Wira Joey Lim and Datuk Alan Chia. 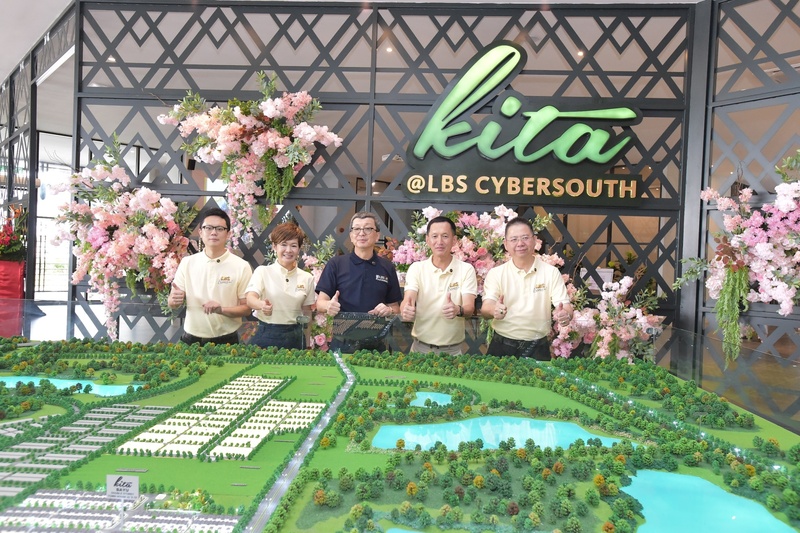 Petaling Jaya: LBS Bina Group Berhad (LBS) recently launched its latest 633 acres township development, Kita@Cybersouth in Dengkil. Catering to modern family and community living, the township comprises terrace houses, townhouses, serviced apartments, shops and commercial units. “LBS takes pride in being a developer for the people that truly understand the needs of homebuyers. This latest township project with its affordably priced homes meets the rising affordable housing demand as well as supports the Government’s agenda of housing the nation,” said LBS Group managing director Tan Sri Lim Hock San. Focusing on affordability, connectivity and community, the self-sustained township provides quality yet affordable homes. The township also features a complete range of amenities with sufficient communal places, aimed at building a vibrant community. “We have witnessed rapid developments in Dengkil as the area has benefited from the socio-economic growth in the southern Klang Valley corridor. As Klang Valley continues to develop towards the south, Dengkil will be the next property hotspot. The houses in Kita@Cybersouth are a great investment opportunity,” he added. The success of earlier phases has prompted the launch of a new phase named, ‘Kita Harmoni’. Comprising 674 units of 20ft x 65ft double-storey terrace houses priced from RM560,000 ‘Kita Harmoni’ provides a sustainable environment that promotes family togetherness. To realise the national homeownership agenda, the developer’s “Kita Impian” offers 964 serviced apartments priced from RM250,000 with built-ups of 551 and 901 sq ft.
Kita@Cybersouth is easily accessible via major highways including the Putrajaya- Cyberjaya Expressway via the Elite Highway, Maju Expressway (MEX), South Klang Valley Expressway (SKVE), North-South Expressway (NKVE), Damansara-Puchong Highway (LDP) and Jalan Dengkil-Banting.